Note: This account has been gleaned from published news reports. See the webography that follows for sources. After waiting almost four years for an explanation, the public finally heard what happened the night two-year-old David Alexander Polreis was killed in one of the most publicized cases involving AT. The original trial was one of the first where Reactive Attachment Disorder (RAD) was a significant element for the defense. As with other attempts to blame the tragic outcome on the child, it was to fail. But Renee Polreis and her AT defenders keep trying. 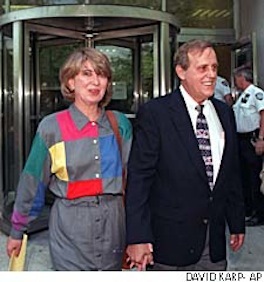 Renee and David Polreis Sr.
Leaving a court session during Renee’s trial. adopted son, after a jury rejected her claim of self-defense. David Sr, claiming that he was distant and unsupportive of her. in treatment, and many are conspicuously uninvolved. Renee, who’d adopted the boy from Russia six months before his death, told a rapt courtroom that she apparently “lost it” the night of February 9, 1996. In the short time she had the boy, she testified, he’d driven her crazy with his tantrums and bizarre behavior, and it was destroying her marriage. Renee claimed that the tragic climax occurred after she had caught David sexually abusing himself with a spatula handle and he had smeared feces throughout the laundry room. Renee Polreis’s long prison sentence reduced. what any unprepared parent could have borne. It was essentially what prosecutors had believed all along. They’d suspected that the boy, who was reported as suffering from Reactive Attachment Disorder, had driven Polreis to the edge with behaviors that included physical attacks on her and her other adopted son. But it hadn’t stopped them from charging her with child abuse resulting in death, or in fighting her request for a sentence reduction later. Polreis’s accounts kept changing during the original trial. First it was that the child had beaten himself to death. Then it was that David had attacked Renee, and she killed the 24-pound boy in self-defense. Observers, prosecutors, and ultimately the jury had trouble accepting any of it. The parents had been taking AT therapists, Byron Norton and Lloyd Boggs, the latter trained at the Attachment Center of Evergreen (ACE). Mourners at little David’s funeral were asked to make contributions in his name — to ACE. From that point on, the AT community rallied to her defense. AT therapist Frank Kunstal from neighboring Fort Collins testified in the trial that children suffering from “attachment disorder” have high pain thresholds. At the sentence-reduction hearing in 2000, Polreis’s lawyers called Foster Cline to the stand. Cline, a former Evergreen psychiatrist who lectures and publishes out of Idaho, has been one of Colorado’s most controversial medical figures, and a founder of the AT movement. In his opinion, Cline said on the stand, David Polreis had suffered from RAD. But that wasn’t why he’d paid his own way to testify. Cline had come to Colorado to plead for leniency for Polreis. Cline claimed to have seen firsthand what RAD-afflicted children can do to a family: parents seeking help for their children describe six-year-olds who hit, bite, swear, scream and kick, four-year-olds who try to choke a younger sibling, boys who hide knives under their beds, girls who threaten to kill their parents while they sleep. The judge reduced the imposed sentence from 22 years to 18. She apparently was paroled in 2007 or 2008, having served less than 10 years for the crime.